Donald Trump’s campaign got caught lying about Aaron Borders. That’s not even the most awkward part. Trump’s Campaign Just Got Caught in a Lie. That’s Not Even The Most Awkward Part. 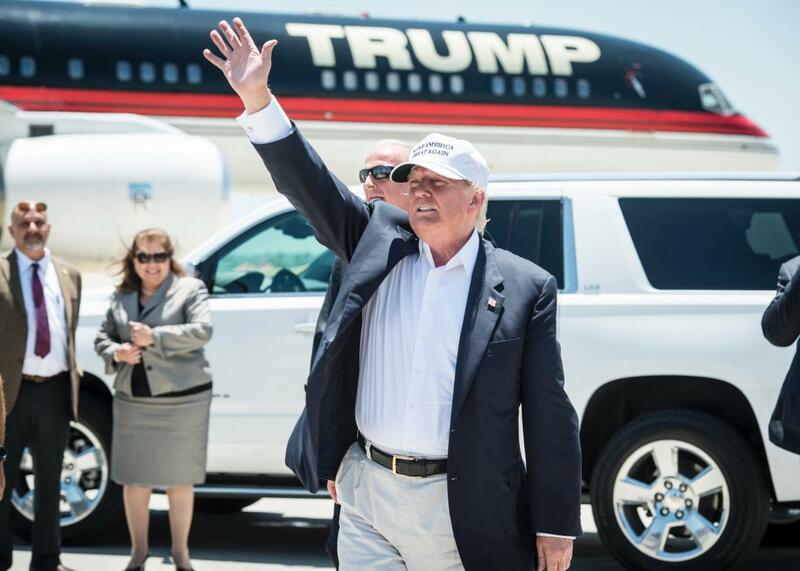 Donald Trump exits his plane during his trip to the border on July 23, 2015, in Laredo, Texas. Donald Trump the reality TV star loves to fire people with the world watching. Donald Trump the presidential candidate? Not so much. At least that appears to be the case with an Arizona Republican whom Trump’s team tried and failed to distance itself from Tuesday night, in the wake of revelations of the politico’s racially charged social media past. When BuzzFeed asked Trump’s campaign about Aaron Borders, a spokeswoman for The Donald originally denied the campaign had any official connection with the man. “I’ve never heard of Aaron, but he appears to be an overzealous volunteer,” said Hope Hicks. The problem with that statement, though, is that Borders provided BuzzFeed with phone recordings of Trump’s campaign manager asking him to draw up a primary plan for Arizona, and expressing intent to hire him. “You help on that. Then we say, ‘Hey dude, you’re the guy, you know what to do, let’s start moving forward on it,’ right?” campaign manager Corey Lewandowski tells Borders in the recording. The dispute over Borders comes only days after the campaign fired adviser Sam Nunberg after Business Insider discovered a number of old racist posts on his Facebook account. “Effective immediately, low level part-time consultant, Sam Nunberg is no longer associated with the Donald J. Trump for President campaign,” Lewandowski told the New York Times in a statement on Sunday. The Borders mess is another reminder of the aggressively nasty way Team Trump does business. But the bigger question is: Why would Trump pass up the chance to deploy his trademark catchphrase and publicly part ways with an intolerant guy who, at the very least, had been in repeated contact with Trump’s campaign and helped organize a high-profile rally in Arizona this summer? The Donald’s decision not to take that path highlights an inherent awkwardness in his intentionally politically incorrect campaign. Trump prides himself on his ability to say what he wants without a filter, even when those comments are bigoted or xenophobic. This is a guy, after all, who launched his campaign with a rambling rant about Mexicans being rapists and murderers. Four years ago, he was beating the birther drum more loudly than anyone. Flash-forward to today, and he’s still unwilling to concede that President Obama is American-born. Given his own track record, then, Trump would have had a difficult time saying exactly what it is that Borders did that was unacceptable to him—easier to say that he was never hired than to explain why he was fired and risk undercutting that same no-apologies brand of belligerence that his supporters love so much.